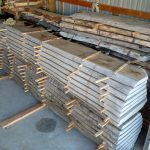 What are Custom Pool Tables? Custom pool tables give the customer the ability to tailor a pool table to fit their home decor and personal tastes. From the choice of wood selection to the custom aiming dots and pocket surrounds. All have the ability to be customized by the customer. Throughout the years we have personalized a large number of our pool tables. The aiming dots have been the most popular to customize. When you order a pool table from us we will ask what style of table you are looking for. Traditionally most pool tables reflect the homes decor. However there is no rule to this. We have built rustic tables for modern homes and contemporary tables for rustic homes. In the end it is up to the customer. In this post I will explain some of the custom aiming dots we have incorporated into our pool tables. One of the more popular styles of aiming dots have been the personalized ones. 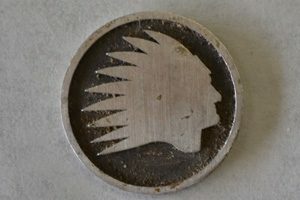 We start with a 1″ diameter metal circle and water-jet the customer supplied initials in to it. With the excess material removed the final design can now be seen. There are several options from this point. The first and most common is to fill in the voids with Turquoise stone. In addition to the Turquoise colored resins or a contrasting metal is often used to fill the voids. We have also been playing with the idea of filling the void with clear resin and using LED lights underneath to illuminate each of the 18 aiming dots. Here you can see what it looks like before we do the infills and the final product. We built a custom table for a gentleman a number of years ago that worked at Chief Oil & Gas. 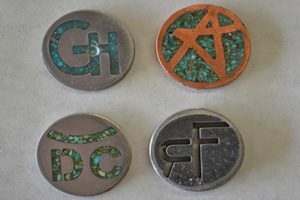 He had these metal pieces with his companies logo and asked if they could be used for his aiming dots. We happily said you bet. 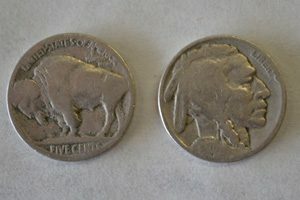 The use of Buffalo Head Nickles for aiming dots has also been really popular. I have a really talented friend who is a professional flint napper. While Paul is well known for his beautiful knives he has made quite a few sets of aiming dots for us. This process consists of heating stones to an exact temperature and then letting them cool. He then proceeds to flake the stone into his desired shape. 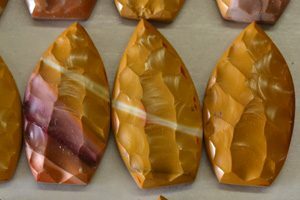 The stone in the picture is Mookaite and is only found is Western Australia. We regularly search for new ideas for aiming dots. The pictures below represent some ideas we have found however have not been used on a table yet. 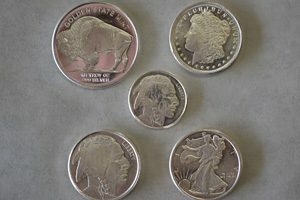 I acquired these silver coins from a minting company that sells fractional ounce coins. 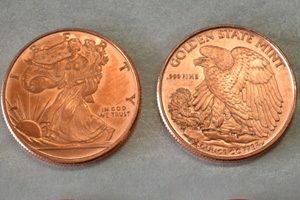 These coins come in tenth, quarter, and half ounce weights. Each is made from .999% pure silver and come in some wonderful designs. For the client who money is of no concern gold coins can also be had. 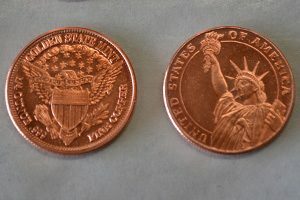 These are pure copper coins that were purchased from the same mint. 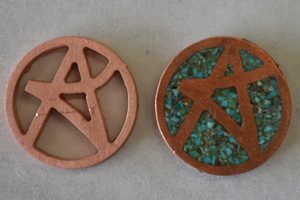 They mint them from pure copper and come in one ounce weights. When you decide to have a custom pool table built you have many options available to you. Throughout the years I have had some pretty wild options considered. The main item you need to decide is how much do you want to spend. My promise to you is that a pool table from us will be one-of-a-kind. Since each pool table is built to a specific client no two will be alike. 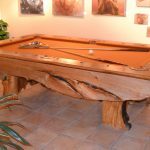 So if you are an individual who loves the finer things in life, a custom pool table from Roaring Fork Custom Billiards would fit the bill.